Perhaps I’m a bit jaded, or maybe it’s an outsider’s perspective, but I am forever amazed at the gullibility of some people in serialized fiction. I sit there reading/watching someone spin a web of lies, and someone else swallow their BS, thinking, “How can you not see you’re being played?” Perhaps it makes for lackluster stories in which I’m supposed to be surprised by someone’s sudden but inevitable betrayal. In this case, it’s the Green Lanterns. 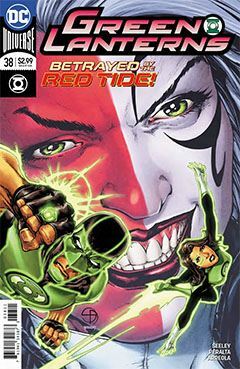 Simon and Jessica have become involved in an internal conflict on Ungara (Abin Sur’s homeworld). A growing movement of isolationists are eager to see that outworlders remain just that. In a final showdown with the movement’s leader, Simon, Jessica and the Ungaran leader are stunned to learn who the true villain of the story is. Me, not so much. But I’m just one reader who has watched a lot of bad TV in his 50+ years. Not that I’ve seen it all, but some plot points are so easily telegraphed. Writers swipe from one another all the time, hoping that whatever fresh spin they put on an old idea is somehow going to catch fire. Younger readers may be surprised by it all, but I fear they are in the minority of most of the Green Lanterns audience. The artwork in this issue does not have the cosmic scale one sees in a sister title like Hal Jordan, but that’s okay. That is a far more ambitious book. This is the same concept on a smaller scale that has successfully carved out its own segment of the comic book audience. It works for Green Lanterns very well, and that’s no small thing.